HARTFORD - It couldn’t have been much easier. The Berlin football team came, conquered and is already thinking ahead for what’s to come next week against East Catholic. 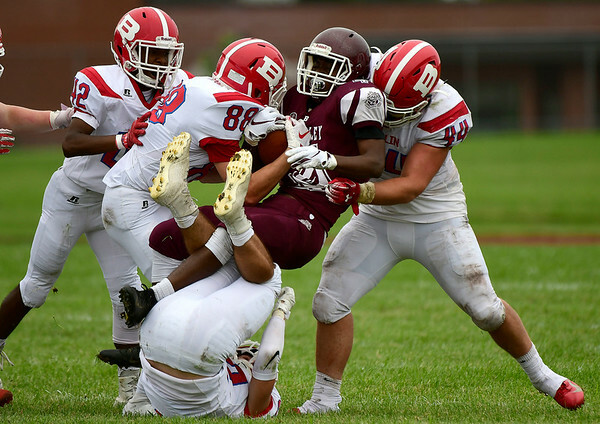 Just as the Redcoats predicted, they shut down Bulkeley/HMTCA/Weaver 41-0 Saturday afternoon at Bulkeley High School. But even though Berlin shut out its opponent, the team looked sloppy. The Redcoats were flagged 13 times for 120 yards. Although it was just the first game, the Redcoats reverted to last year’s ‘young’ team, which was known for making numerous mistakes each and every outing. If Berlin wants to reach the playoffs, and ultimately the state championship it covets, it knows it has to eliminate those issues. But there were plenty of positives as well. The Redcoats did rack up 41 points and scored three of its seven touchdowns in the first quarter. It was also a chance to see Dunn operate the offense in his second season as Berlin’s signal caller. Last season, Dunn was called upon to manage the game more. On Saturday, the senior show off his arm. He completed on 18 of his 27 passes for 263 yards and three touchdowns. Larry St. Pierre was on the receiving end of two of those touchdown passes and rushed for another. Running back Alex Halkias scored twice on the ground as well. Dunn connected with St. Pierre for a 14-yard passing touchdown five minutes left in the first quarter. Prior to that, St. Pierre rushed one yard into the end zone for the game’s first score. Just as the first quarter was about end, Marco Scarano found the end zone on a 39-yard pass from Dunn. Berlin closed out the quarter 20-0 over the Bulldogs. Halkias finished the afternoon with nine carries over 111 yards, including a 45-yard touchdown with 7:33 left to go in the first half. As time expired in the half, Dunn connected with St. Pierre on a 5-yard pass as Berlin widened the gap to 34-0. A majority of the penalties were made in the third quarter. Berlin’s last touchdown didn’t come till the final quarter when Halkias rushed 10 yards into the end zone. Rushing- Berlin: Halkias 9-111-2TD, Scarano 1-39-TD, Zach Hurbiec 4-26, Johnny Mcgeever 1-4, Dunn 1-9, St. Pierre 1-1-TD, Kyle Krupa 1-4, Josh Wood 1-(-1). Bulkeley: Adrian Wiggins-king 11-31, Anthony Regis 6-26. Passing-Berlin: Dunn 18-2726-3TD. Bulkeley: Zahir Akbar 2-9-13, Christopher DeJesus 3-6-0. Receiving-Berlin: Scarano 1-39, St. Pierre 4-28-2TD, Alex Halkias 5-110, Zach Hrubiec 4-49, Tufano 4-47. Bulkeley: Christopher DeJesus 4-18, Tahj Fothergill 2-(-5). Posted in New Britain Herald, Berlin on Saturday, 8 September 2018 17:37. Updated: Saturday, 8 September 2018 17:39.